The aims of this study are to identify the potential environmental risk factors associated with ALS and better understand the basic biology of ALS with the direct goal of preventing ALS and advancing ALS treatments. Participants in this study complete a comprehensive assessment of environmental risk factors. In addition, many participants choose to provide a sample of blood and small skin sample to help us better understand the causes of ALS. Some of the most important discoveries about the causes of ALS come from studying tissue from persons that had ALS. For this reason, some of our patients choose to donate their brain and spinal cord after death for research purposes. This tissue allows us to advance our understanding of ALS and develop new therapies. This program is of no cost to patients and families and does not delay funeral arrangement. Please talk with us if you are interested in participating. 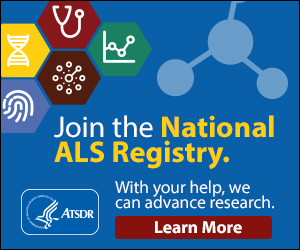 Participation in the National ALS Registry is voluntary, however, joining it can help scientists defeat ALS. We encourage all our patients to register. In addition, through your registration you may be able to participate in research trials offered through the country. This study aimed to validated a shortened version of the ALS Specific Quality of Life – Short Form Instrument (ALSSQOL-SF). The ALSSQOL-SF is a short questionnaire that asks broad questions about emotional, spiritual, and support related issues.